Spending all your day gathering sticks for a hot shower is just no fun. No fun at all. Mind you, anything that results in a hot shower (or even better, a hot bath) has to be considered a priority at Milkwood. So when Nick finished converting the old ‘Sunbeam Sheep Shower’ structure (basically a new-fangled sheepdip) to a shower block with a little wood-fired, home-made firebox thingamy to heat the water for the shower and the bath, that’s what we did. Lots of stick-gathering. The romance of wood-fired hot water quickly wears thin, however, if your water-heating system is not terribly efficient. Because this means the system requires a fair deal of wood to heat the water, which therefore releases a corresponding amount of CO2. And also results in lots of stick gathering. So Nick went searching for the most super-efficient, super-simple and super-funky heating system idea he could find, which could then be converted to a water heating system. And thus we discovered the glory that is the Rocket Mass Heater. Hey, there’s an update to this system! 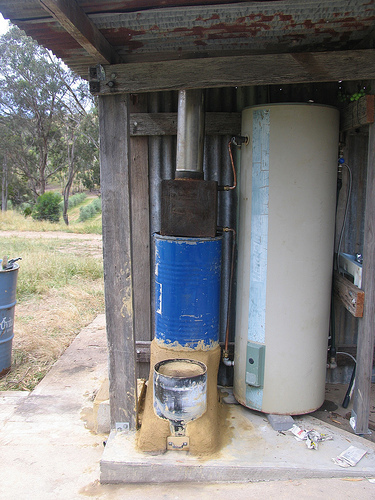 Read our Rocket Stove Water Heater Redux to have a look at this system, 2 years on.. The basic premise of a Rocket Mass Heater is that the heat energy of a small, very hot-burning fire is used in a optimal way to get the utmost out of that heat energy. Hyper efficiency with minimal fuel input. Ianto Evans + Leslie Jackson, a couple of Permies who are prettymuch gurus on this subject, put together a great little book called Rocket Mass Heaters and this was our inspiration and guidebook for our project. The heat of the small fire is drawn up through a vertical heat riser of some kind, which creates an updraft and therefore causes the fire to burn extremely hot. A hotter burn means less smoke. And less smoke means more hot water per handful of sticks. Then the hot gases in the riser is put to work – pushed (or pulled) under hot plates, past water boilers, underneath cobb benches, through thermal mass walls – wherever you need to heat. By the time the hot gases make their way out to the outside world, they are spent, and much cooler – the heat energy has been transferred along the way to whatever needed to be heated. Hurrah! Rocket Stoves are quickly catching on in various places around the globe – because they’re so fuel efficient, for example, they’re being used in development aid projects where fuel is scarce. And because they’re super simple, they can be made by prettymuch anyone with a need, a plan and some simple tools. 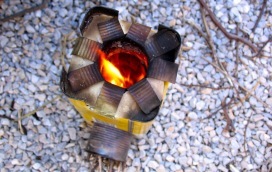 There’s a stash of great Rocket Stove projects that have been done around the world at RocketStoves.org. But back to us at Milkwood. 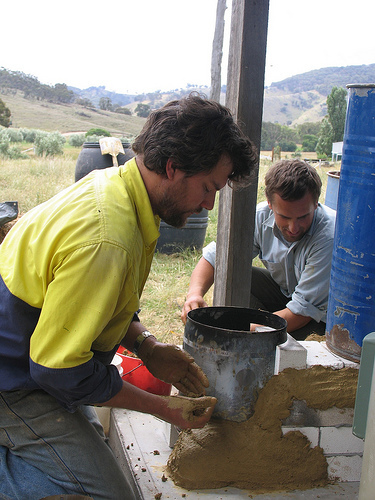 The making of our Rocket-Powered water heater took two days for two blokes. The above diagram explains it all pretty well. 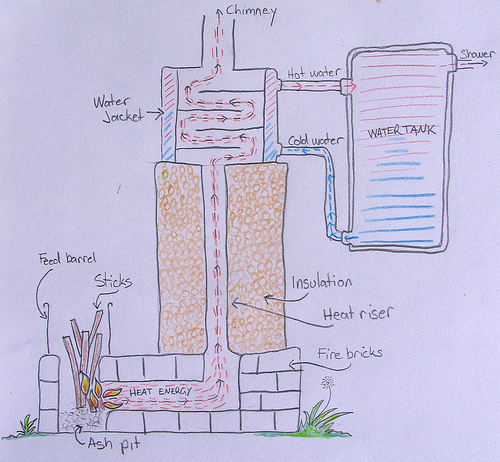 Firebricks in a pattern with a burn chamber in front, topped by an insulated heat riser, topped by a small heat exchanger, topped by a chimney. The water came in one end of the system from the bottom of the water tank, then passively circulated between the heat exchanger and the hot water tank (just a normal hot water tank like you would have on your normal western hot water system) once the fire was going via simple pipes and the power of convection. A handful of sticks in the burn chamber set the fire going. 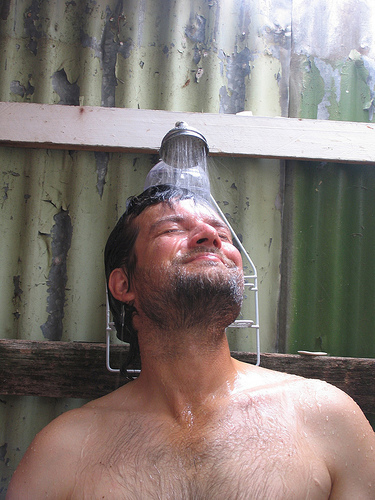 Then we waited and finally turned on the shower tap and… voila. Steaming hot water for one shower. Hoo-bloody-ray. Post-wash, the water flows into a greywater trench which waters a planting of She-Oaks (Casuarinas) downhill from the showerblock. These will, in time, yield excellent stickwood for the fire, as Casuarina wood is some of the hottest burning wood in the world. Which is the closest we’ll come to closing the loop (in terms of energy, carbon and responsibility) on our daily shower anytime soon… which makes for a very happy shower. Here’s a Flickr set of the construction process – it should give you a good idea, it’s fairly thorough. 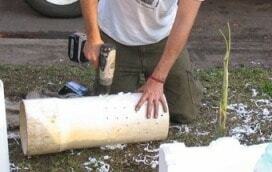 Feel free to ask questions if you like, I’m sure Nick would love to wax lyrical about his beloved Rocket construction. So viva la Rocket Stove. These things are hyper-efficient. They should take over the world, I rekon – what is a better beacon for sustainable, responsible living than a guilt-free hot bath? **Notes on this system for safety: you want a pressure release valve on the hot water tank (most have them on already) so the water tank doesn’t explode, and also a tempering valve on the hot water outlet (so no water hotter than 60º comes out), so that no-one burns themselves during their lovely wood-fired shower. Rocket stoves have become a part of our lives at Milkwood Farm. T . .
a few questions on the shower. Look forward to constructing one of these in a few weeks. you can see the water inlet in the photos + diagram – the little pipe going into the side of the black box at the bottom. water outlet is the one coming out of the side of the black box at the top. water pressure comes from a header tank up the hill, which is hooked up to the main water tank (big beige thing). the water cycles in and out of the heat exchanger (the black box) via convection. The heat exchanger is an exaggerated form of an excellent and essential household utensil for boiling water as well making tea which extensively used in Central Asian Republics and Iran, Pakistan, Russia etc. One can google the word ‘Samovar’ to find the detail of this beautifully crafted utensil. Yes you are right the heated air pass through the middle. In the Pakistani city of Peshawar people love to drink green tea, sending you the picture of one of the numerous tea stalls. you will have to scroll down the cursor a lot ……the internal image of samovar is in the end of the blog. Another excellent website on masonry heaters, there you will find tons of information on the subject. How do you deal with overheating of the water tank and possible explosion? Does the water tank have a temperature pressure release or something of this kind? Brilliant!, one question does the hot water get much rust in it? Can you clarify the rest of your water system including the “header tank.” Is the shower is completely gravity fed? Do you require electricity to pump water into the header tank? A post would be great. Thanks! 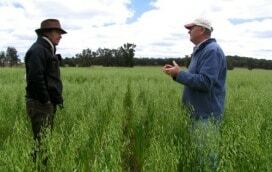 Hi Jax – yep the header tank feeds via gravity along to the system. The header itself is filled by an electric pump (as most header tanks are) running off grid-connect solar power. its a double pipe and runs on lamp oil. Great idea! I’ve read your follow up articles where you mention the creosote build up problem. You pretty much shrugged your shoulders. And said you would have to live with it until you could source a better fuel source. I know, it’s easy for an arm chair quarterback, with out the hands on experience, to make suggestions. But, I’m going to do it any way. First, I’ve always been told creosote is the product of the incomplete burn of chemicals in the smoke being allowed to cool before adequate heat and oxygen could allow them to burn completely. What if #1: What if you introduced secondary air to help burn these un-burnt gasses? What if #2: What if you located your H2O tank directly above your heat riser, more like rocket mass heaters, making the bottom of the tank the primary heat exchanger. And if that didn’t provide enough heat exchange surface put a skirting below the tank, which would go around the outside of the heat riser, again, more like a rocket mass heater, and locate additional heat exchange surfaces between the heat riser and the skirting? 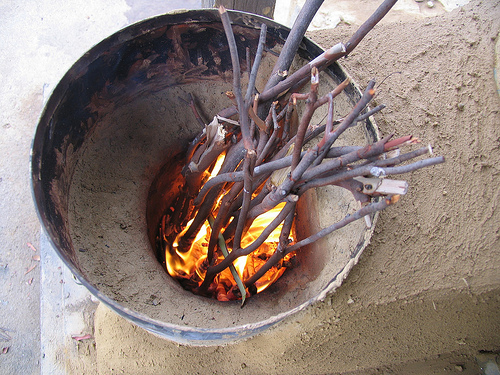 In a nut shell, one of the primary advantages of the rocket stove is the near complete burn of fuel. If you are getting creosote, you are not getting that.